Investors can use mutual funds and ETFs to buy a wide swatch of stocks or bonds without making too large a bet on any one company or sector. Take the S&P 500. You can buy the entire index, and the gains of the nation’s largest companies that comprise the list, for a minimal amount with either the Schwab S&P 500 (a mutual fund) or SPDR S&P 500 ETF (an exchange-traded fund). You don’t, then, need to make a specific bet on what General Electric or Apple will do over the next year or so, you can instead bet on American economic growth. Both options charge investors extraordinarily low fees, in this case the mutual fund actually beats out the ETF. In fact, you can easily create a fully diversified portfolio with only three mutual funds or ETFs, using solely one or the other. If you’re planning on using dollar-cost averaging, where you make predictable contributions to a fund, you’re better off going with a mutual fund. That’s because many mutual funds are available with no transaction fees and no sales commissions. ETF customers might have to pay trading commissions, making frequent buying and selling expensive. That can add up. Assume someone invests $500 on a biweekly basis in both an ETF and a mutual fund. Both investments get 8 percent annual returns, net of their expense ratio. 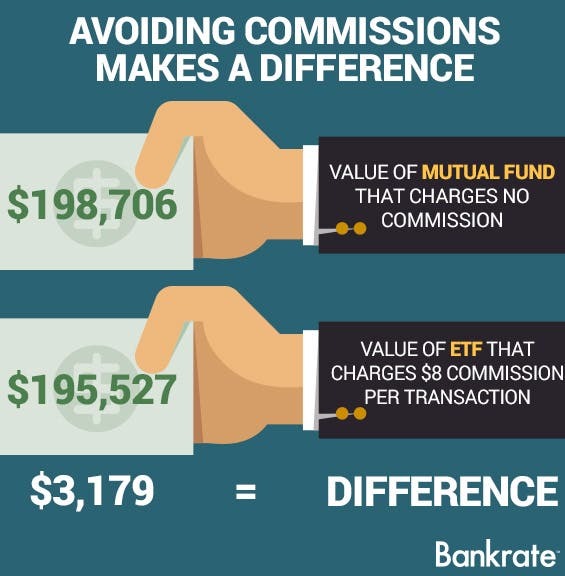 The only difference is that the investor pays an $8 commission biweekly with the ETF. After 10 years, this is what the investor has accumulated in the two funds. An advisor can help you evaluate your options and invest for your financial situation and risk tolerance. You can work with your advisor to find an investment blend that takes into account your target retirement age, tolerance for risk, and your vision for retirement. Principal allows you to mix your investments by asset type or even management style, with a roster of experienced portfolio managers to help you handle the complexities.